Several scientists are known for their many great works and inventions. This book is about one such scientist who is responsible for one of the greatest discoveries of all time, Albert Einstien. 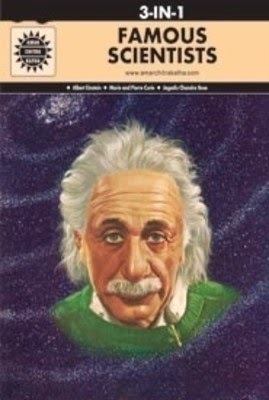 In 1999 the famous scientist, Albert Einstein, was given the title of the person of the century by a reputed magazine which was not an accident. It was the work of the man himself and those who helped him with his experiments which has given us a change in the world we live in today. Whether it was Bose's revelation that even the plants around us can feel electricity, to Curie's discovery which was that of radioactive elements and Albert Einstein's discovery that time and spaces can only be defined in relativity to each other, this book give us a detailed account of the achievement of these scientist who have given humans a whole new perspective of life. Amar Chitra Katha is one of the largest selling comic book series. It was started in 1967 with more that 400 titles on mythology, history, folklore and Indian epics.